ATLANTA, GA - Sophomore wing Curtis Haywood told Georgia Tech sports reporters that, "Georgia Tech will run and could be one of the fastest teams in the country." As many well know, this has been Coach Josh Pastner's intent since he took the reigns in Atlanta, recruiting guards that would thrive in the up tempo world such as Jose Alvarado and Mike Devoe as well as bigger wings that can shoot. This comes as no surprise since that's how Pastner primarily built his teams at Memphis. Personally, I would not mind seeing an uptick in tempo when it comes to Georgia Tech basketball. For far too long the program has wallowed in the depths of what can only be described as a boring type of basketball. My main questions about this approach is: Are the Jackets ready? Why not last year? The obvious answer there is that center Ben Lammers would have suffered in that style, but does Pastner have the horses this year to run? Last season the Yellow Jackets ranked 277th in adjusted tempo (possessions per 40 minutes) and 197th in adjusted offensive efficiency (points per 100 possessions) according to Kenpom. In fact, the last time a Georgia Tech team finished better than 142nd in adjusted tempo was 2011 when the Jackets finished 55th. That year they were also 191st in adjusted offensive efficiency and finished the season at 13-18. In a recent press conference Coach Pastner did acknowledge that he wants to pick up the pace but also said that, "we'll see if I stick with it." While I am unsure if the Jackets currently have the horses, I am sure that the current roster is made to run. Outside of redshirt senior center AD Gueye, there aren't any bigs on the roster that are traditional post players. 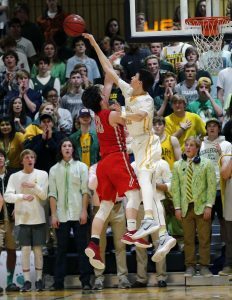 Sophomores Moses Wright and Evan Cole both project as big fours who would thrive in a running game as opposed to back-to-the-basket, on the block big men. I also believe that transfer Shembari Phillips and true freshman Khalid Moore will benefit from the court opening up in front of them. One concern I admit to having is defense. Last season the Jackets ranked 61st in adjusted defensive efficiency (points surrendered per 100 possessions), a ranking we should expect to suffer when coupled with giving the opposition more possessions this season. Add in the departures of perimeter defender Josh Okogie and rim protector Ben Lammers, and it becomes more difficult to project a top 100 finish in that metric. The catch-22 here is that if Pastner does not kick up the tempo soon, recruiting may continue to be a struggle. Of course, if he goes up tempo and doesn't win basketball games, his seat may heat up around year 4 and then...recruiting will be a struggle. This storyline may be the most interesting going into the 2018-19 season. If Jose Alvarado and Curt Gone Bad (Haywood's nickname via Twitter) both return completely healthy this season that would be a tremendous start. Stylistically, a run and gun offense makes a player like Alvarado a terror for opposing teams. Let's see how it plays out. ATLANTA, GA – For media and fans alike, Georgia Tech's annual football media day provides the first opportunity to meet the newest version of the Yellow Jackets. GTSwarm was fortunate to attend for our fifth year running. Just like last year, we asked 8 student-athletes the same four questions, and the following are the results of the poll. Question 1: What are the team's expectations and goals for the 2018 season? Team Theme: The Jackets are working week in and week out to compete for the ACC Championship. Question 2: Which players have emerged as leaders of this year's team? Team theme: TaQuon Marshall on offense, Brant Mitchell on defense, and the entire senior class as a whole are stepping up both on and off the field. Question 3: Which team/game are you most looking forward to playing? Team theme: Eyes are focused on taking it one week at a time. Alcorn State is first up, even though there's a slight eye towards that last regular season game. Question 4: What is your pregame routine? Does it vary by opponent? Do you have any special superstitions? Team theme: For a bunch of helluva engineers, there's not a lot of method to the Yellows Jackets' pregame madness. Most just try to relax , take in the atmosphere, get into a zone and get ready to go. But one question needs to be asked: Can AD Todd Stansbury please get a designated Twizzlers guy on staff? Mickey Pearson, a 6’7” forward out of John Hardin High School in Elizabethtown, Kentucky, was at one time a Saint Louis Billikens commit in their 2018 recruiting class. On June 19th, he decommitted to reassess his options. Pearson is an athletic wing with a variety of moves that make him look dominant on the court. From throwing down vicious two-hand alley-oops to pulling up for 25-footers, Pearson has a plethora of moves to pull out of his bag. While Pearson continues to play well and averaged 25.5 points per game last year, he is still not getting the same national recognition as others with similar stats in his class. “I would say my high school competition and where I play high school at is affecting that the most,” states Pearson. Georgia Tech has been linked to Pearson in reports since the re-opening of his recruitment, and Pearson confirmed. “I have been in contact with all the coaches at Georgia Tech,” says Pearson. He has since visited Ole Miss and Louisville but tells me those visits will be the last for this year’s recruiting cycle, “No more visits,” said Pearson. “I plan on going the postgraduate route but I’m just not sure which one as of right now.” Doing so will make Pearson a 2019 recruit. As we have seen in many cases, doing a postgraduate year is very beneficial, and it is something Georgia Tech is familiar with. Sophomore guard Curtis Haywood did a postgraduate year, and it is one of the reasons he wears number 13. Provided that Pearson continues to showcase his ability against higher competition, he should continue to be on Georgia Tech’s and the Power 5 radar. Robbie Beran with the swat. Standing 6 feet 9 inches tall and weighing in at 210 pounds out of Richmond, Virginia is versatile combo forward, Robbie Beran. Beran, a sharpshooter from Virginia, plays high school ball at the Collegiate School while running with Team Richmond Garner Road during the AAU season. Who is Beran to Georgia Tech? 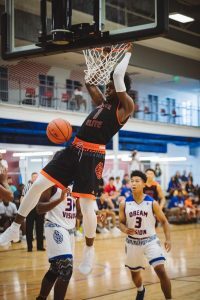 A prospect squarely on Yellow Jackets coaching staff's radar following his performance on the adidas circuit this summer. On July 14th he was offered by Georgia Tech and Beran is happy to see the work he is putting in being rewarded. “I’m always excited for each offer. Georgia Tech has a tradition of excellence, not only on the court but also off the court with their academics,” says Beran. Beran has heard consistently from Georgia Tech and is listening to what they have to offer. “Coach Swartz is leading my recruitment and I’m just learning more and more about their program and Georgia Tech as a school each day,” says Beran. With the ability to put the ball on the deck and create his own shot, Beran has the capability to be uniquely utilized in mismatches with his guard skillset, all while standing 6’9”. “In talking with the coaches I don’t think they want me at an exact position. I try to play positionless and impact the game in as many ways as I can,” states Beran. With reported offers from multiple prestigious academic schools including the likes of Georgia Tech, Boston College, Bucknell, Richmond and Columbia, it is safe to say Beran is getting it done in the classroom. As a matter of fact, he has crisp 4.0 GPA. Not only is Beran a baller on the court, he is ballin’ in the off the court in the classroom. Sounds like a great match for the ACC's Georgia Institute of Technology. Coming out of Sumter, South Carolina, which has recently become a hotbed of basketball talent, and standing 6 feet 6 inches, 220 pounds is Calvin “CJ” Felder. From playing alongside Ashton Hagans to Christian Brown, one might think it’s easy to get overlooked. Not Felder, who has continued working hard and is starting to see his efforts come to fruition. Felder was offered by Georgia Tech this week and already holds offers from Virginia Tech, UNLV, Clemson, Memphis, and Auburn among others. “My initial reaction from receiving an offer from Georgia Tech was excitement because I know how big of a program Georgia Tech is, along with how many big-time players have come through there,” said Felder. Felder has been to Atlanta multiple times for AAU events and is ready to make it to Georgia Tech. “I have not been on campus, but I want to set up a visit really soon.” Felder already has ties to the state of Georgia and Atlanta with his go-to post-game meal being Zaxby’s. He also has Gucci Mane and 21 Savage on the pregame playlist, with Kodak leading the way. On the floor Felder is very athletic, physical, and has the ability to play above the rim. He alters shots at rim and hits the glass hard. He also goes all out every single play like an Atlanta native that Georgia Tech pursued last year. “I try to sprinkle in a little of Collin Sexton in my game when it comes to passion,” stated Felder. He also tries to emulate Sexton’s off the dribble pull-up and Chris Paul when it comes to basketball IQ, with LeBron James being his ultimate model athlete. Felder wants to major in meteorology. He wants fans to know he has a lot of passion for the game of basketball and will give 110% every time he steps on the floor. In my opinion, despite the Power 5 offers, Felder is a sleeper prospect. He has a great motor and is that hard working player every coach could use on their team.